This race started in 1998 is a race scheduled at the end of the season. The race is a long distance event. The Race Committee will attempt to set a course to circumnavigate the entire lake. The event will be one race and all boats will sail as one handicap fleet. The TRANSJAC TROPHY is awarded to the 1st place skipper. This award, new in 2010, is a 2nd place award for the TRANSJAC race scheduled at the end of the season. The winning skipper will also receive an engraved keeper trophy. 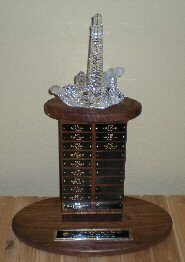 The award is engraved with all past runner up skippers and the year since the TRANSJAC event began in 1998. The award is named in honor of Don MacClymont. Don was an active racing sailor who contributed his wealth of sailing knowledge and competitiveness to the mid west sailing community. Don generously supported and participated in many club events on or off the lake during his many years with the Jacomo Sailing Club. He was one of our greatest treasures.